It seems autumn has finally arrived! 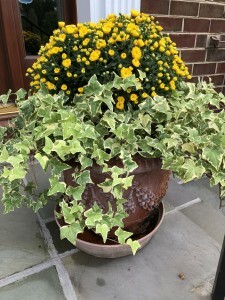 In celebration, I always am drawn to the nursery to bring home a few of my favorite harbingers of autumn, the beautiful chrysanthemum. I am going to give you some tips today to give you at least DOUBLE the blooming time on these beauties. Sometimes I have kept them going for almost three months of flowers using this strategy. When purchasing mums, look for plants that are just showing color, but in a bud stage. This will give you the longest amount of time to enjoy. 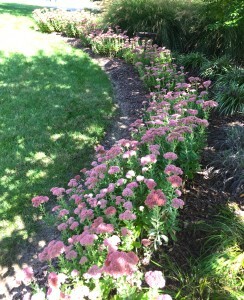 First, when choosing your mum, buy one that is still in the “color showing bud” stage. This way, you will have the opportunity to get every minute of flowering time. 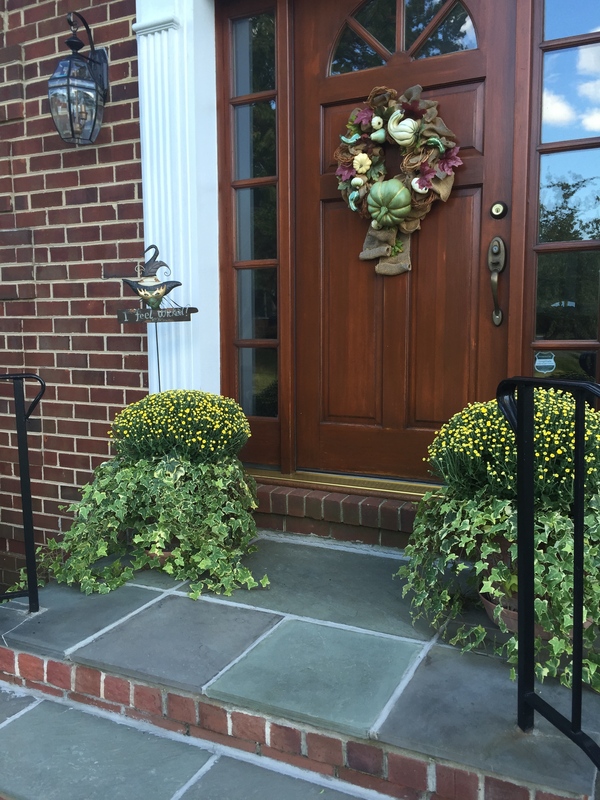 Instead of planting the mums in the garden, plant them in pots at least four inches larger than the nursery pot that they come in. 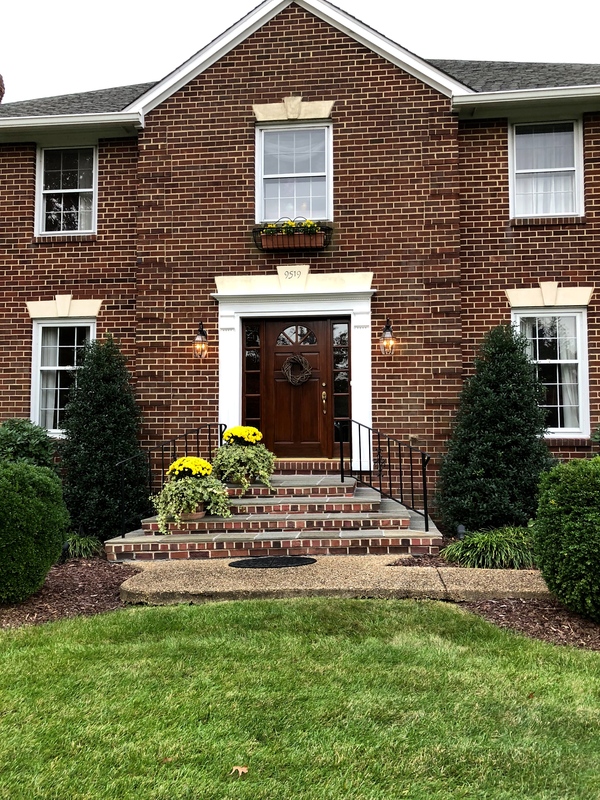 This allows you to pull them under cover of a porch, garage or even into your house during fall rainstorms — their biggest enemy! 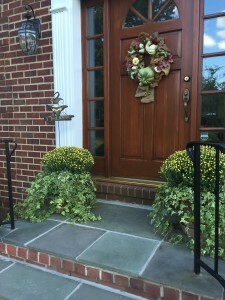 Mums in all their glory are one of the most beautiful sights of fall. I love to have some by the front door to great visitors. When watering the potted mums, just water the the root zone from under the foliage. This is very important. Water on the flowers after they open will kill the flower. 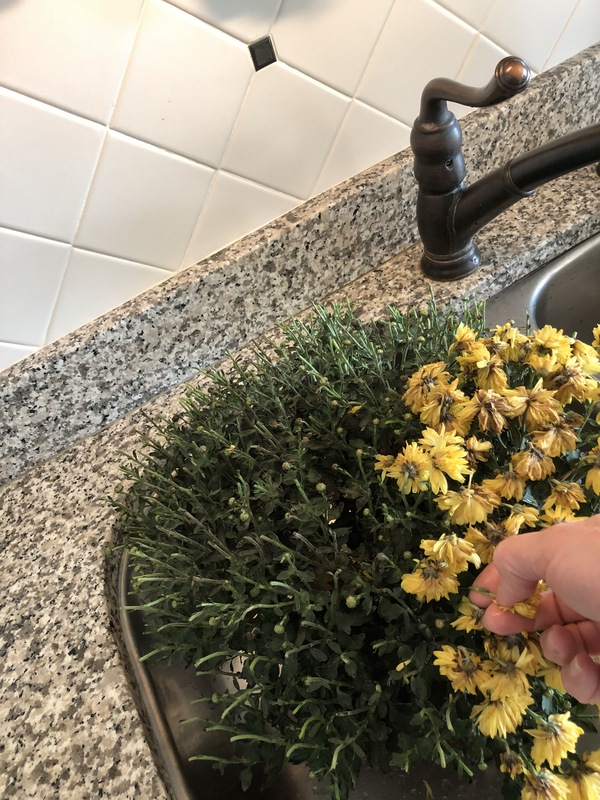 It breaks my heart when I see a well-intentioned gardener plant their mums and then water from above with a hose, only to see that the mums are dead the next week. Watering only the soil keeps the foliage and flowers dry and protects them. Using this method should give you at least a month and half of bloom time. Deadheading your mum after the first set of blooms have bit the dust will expose a second set of blooms. You can have double your bloom time! 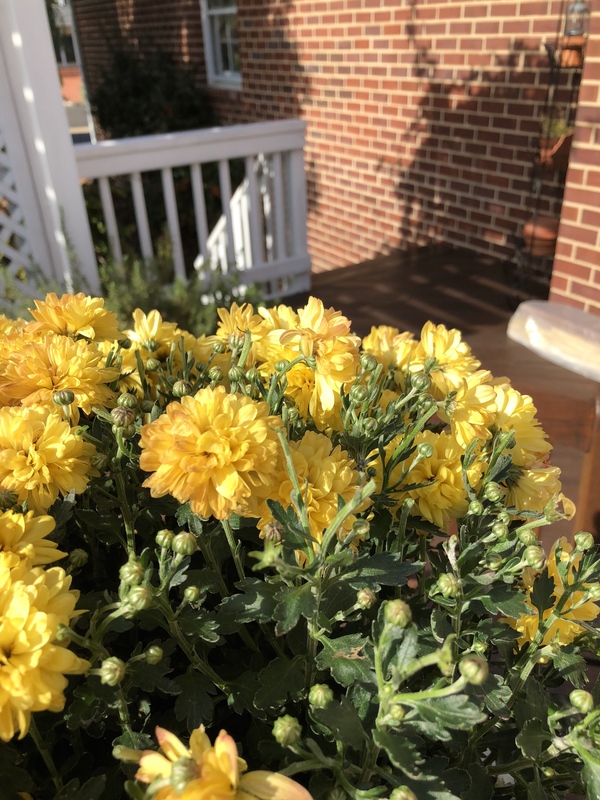 Now to extend that month and a half of blooms for a month or possibly even more, here’s my final tip: deadheading. If you remove the first set of blooms when they have finished, you will see a second set of buds hidden underneath. These are smaller, but will provide you with a second bloom cycle of flowers. Double the fun! 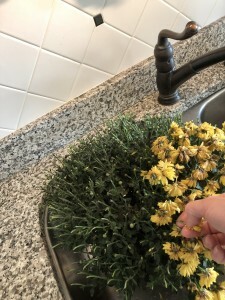 I hope you will give this method a try if you love mums as much as I do. Happy autumn gardening everyone! Hi everyone! We had an unbelievable amount of rain here this year, almost double our annual rainfall total. The air feels like a sauna even in October. It’s been hard to spend more than a few hours outside at a time in the heat and humidity — but you know I can’t stay inside, and there’s work to be done! This type of steel rake is my favorite choice for de-thatching and preparing the soil for overseeding. Just look how much debris it removes! My priority now is renovating the lawn. Normally, I would finish this completely in September, but the weather has put me behind schedule. 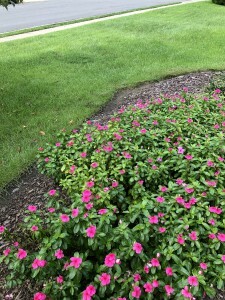 To do this right, I started by weeding the entire lawn by hand, as opposed to using an herbicide. 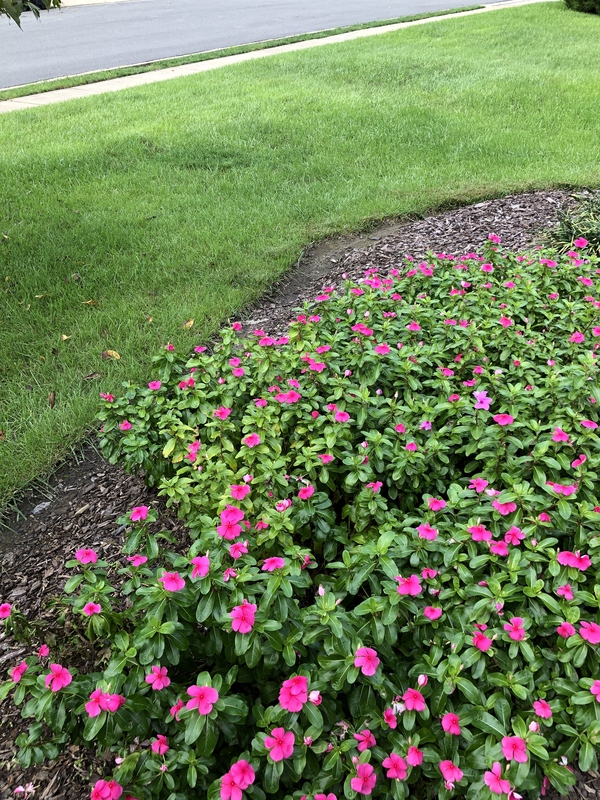 When planning to overseed, one needs to make sure not to have any chemicals on the lawn which could interfere with the new seed sprouting. 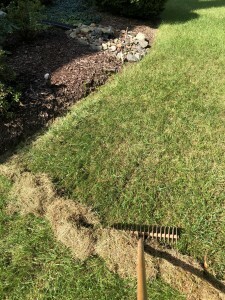 I am using a specialized steel rake to get every bit of thatch out of the lawn — a tool I inherited from my grandfather. This is THE most grueling step. After de-thatching two-thirds of the lawn, I have collected more than a dozen full bags of debris (don’t worry — you know it’s going to the compost heap). I’m impressed with how effectively this steel rake pulls out the thatch — and it loosens the surface, which makes for great new seed contact into the top soil. Everyone who walks by while I’m working asks me why I don’t just use a machine for this, but if you saw how much better this works you’d know why! 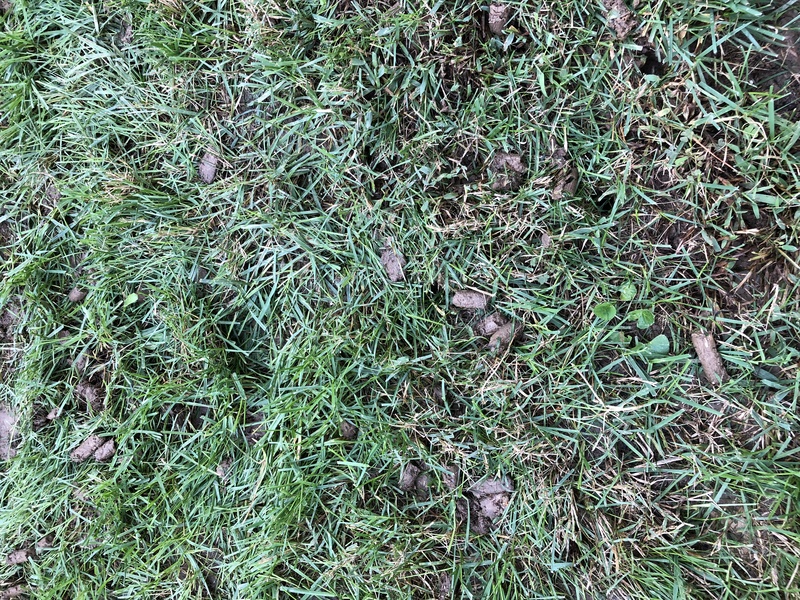 I bought a premium seed that has a variety of grass types: some that sprout within a week to stabilize the bare spots, and additional varieties that will be sprouting over the next few. 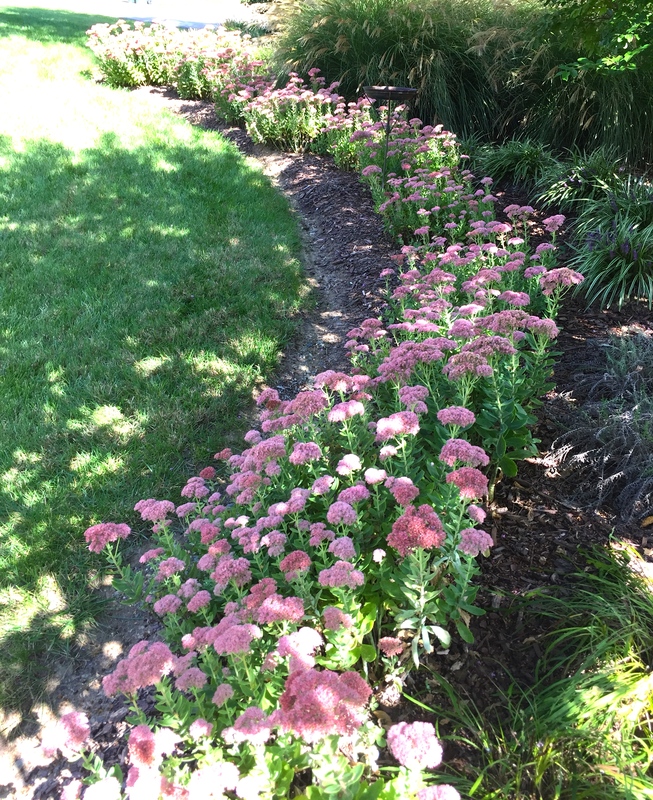 This mix also had a seed-starting fertilizer mixed in, but if the variety you purchase doesn’t have this, I’d recommend using some. Keeping things moist while the seeds are doing their magic is key, but with all the rain we’ve had, I’ve only had to water the new seed a few times. 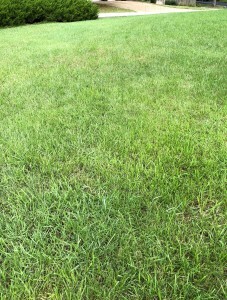 With the combination of sod, seed and fertilizer you can hardly see where the old tree stumps used to be! I’m happy to say that I finally was able to easily pull out the last of the roots from two pear trees which used to grace the front yard. Now those areas are much smoother in elevation. The vast majority of the surface roots came out with the tree, but a few deep ones remained. 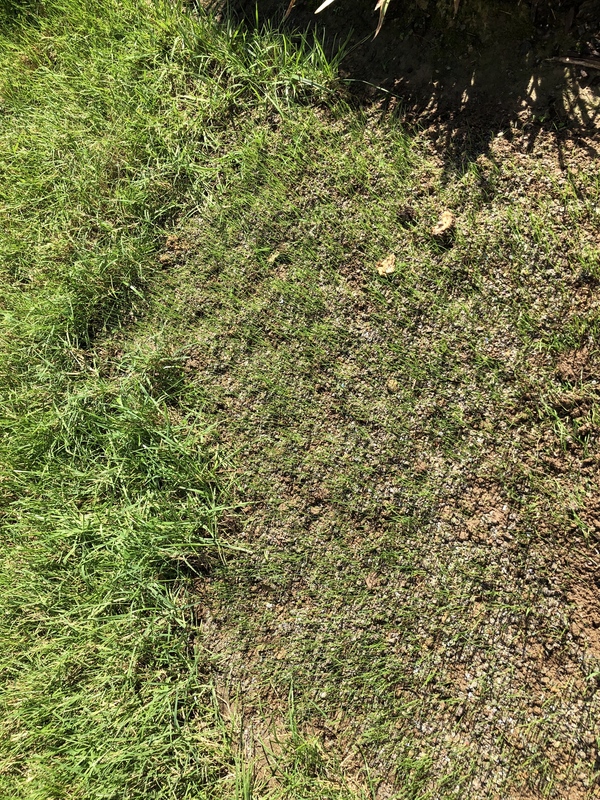 On these areas, which were quite large, I used a couple of pieces of sod and more seed around the edges to completely fill it in. Now you’d never know that those were trouble spots! Once the new seed reaches three inches tall, you can start mowing. 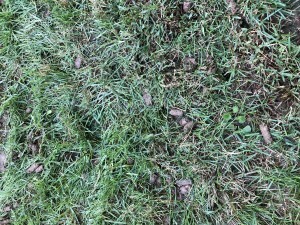 We gave our newly-seeded lawn its first mow this week. 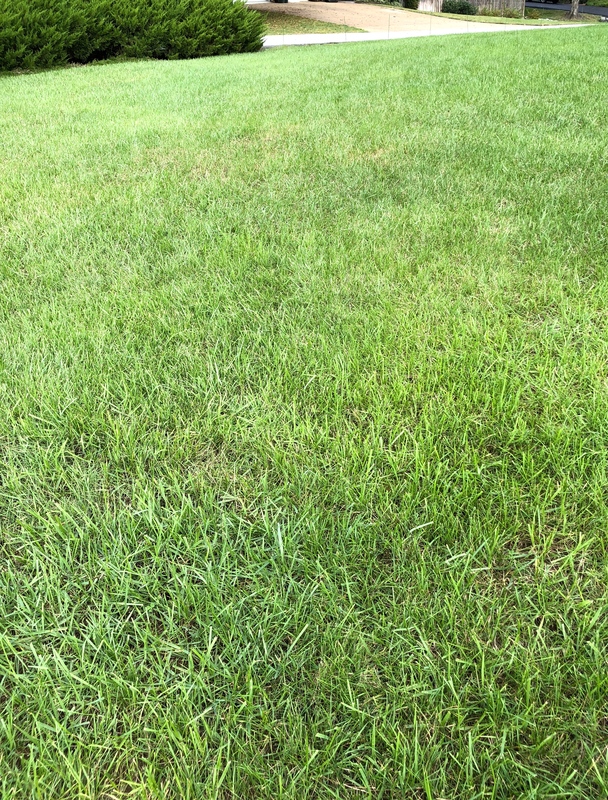 I have a tip for this, too: Set your mower to highest level first, because after a few weeks of not mowing, the existing grass will definitely be quite long and would clog the bagging chute. 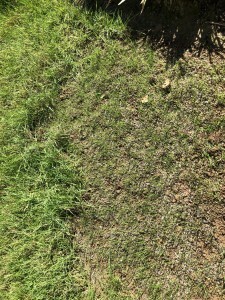 In a couple of days, set your mower to the normal level and cut it again. 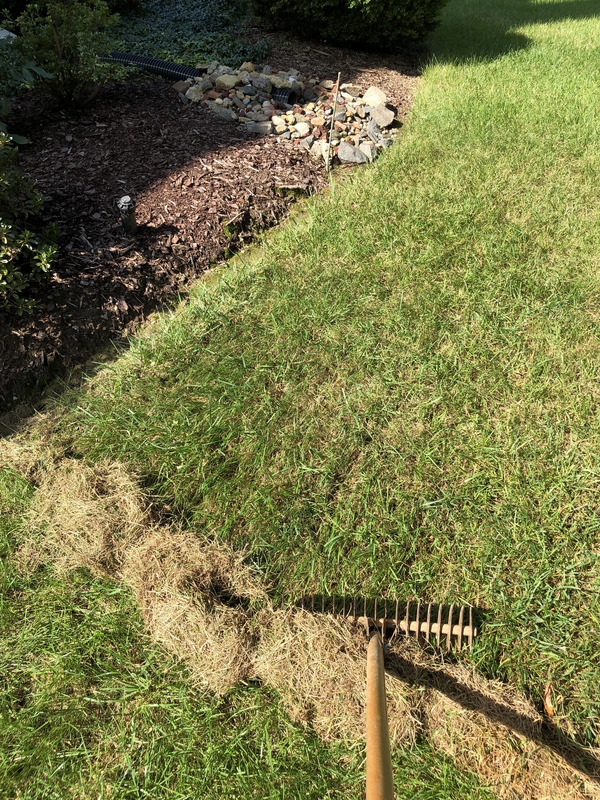 This way your lawn won’t be stressed as much — and you won’t create new thatch by using a clogged mower! Yes! Nice new seedlings emerging. I’m hoping the weather will cooperate so I can finish up my raking this week, but (if you can believe it) we have a new hurricane bearing down tomorrow night, and two more in the Atlantic pipeline. Hope everyone stays safe, and best of luck — I’ll be back with some pretty fall flowers next week! Wishing all my readers a happy and healthy Fall!